Actually, if you’re a new scout (or leader) you may need a shirt first, right? Right! You can get your son’s scout shirt at the Scout Shop [map] near the Dane County Airport (along with the numbers 1-5-5, a neckerchief slide, or a hat — which is optional). This combo of your shirt, neckerchief, and neckerchief slide (with or without hat) is known as the formal uniform, or “Class A Uniform”. If you buy the complete Class A uniform the Scout Store will give you a $10 OFF coupon on the spot! The “Class B” uniform is a Pack 155 t-shirt, which we sell directly to you from the Pack. Class B t-shirts can be worn to informal events or when the event is one where the boys’ Class A may get dirty or damaged. You can request a Class B shirt by clicking here. As scouts grow older, get bigger, or move on to Boy Scouts they may be willing to part with their old shirt. If interested in sharing a shirt or acquiring a shirt, let your den leader know and they can put the word out to other Pack leaders. Please know, if your family is in a situation where you may need some financial assistance with things like this, please contact Cubmaster Tony (or another trusted leader) and they can arrange for help. Any conversations along these lines are strictly confidential — we never want costs to get in the way of your son participating in scouting. Whether you’re new to Scouting or a grizzled veteran that just earned a new rank, sometimes you just aren’t sure where some of those patches you’ve earned go on your uniform. Here’s a quick guide to help you out. A diamond-shaped cloth badge, gold and black embroidered on light blue background with gold trim. Worn on the left pocket, in the 12 o’clock position. A diamond-shaped cloth badge, orange and black embroidered on orange background with gold trim. Worn on the left pocket, in the 6 o’clock position. A diamond-shaped cloth badge, black and gray embroidered on red background with gold trim. Worn on the left pocket, in the 9 o’clock position. A diamond-shaped cloth badge, brown and black on green background with gold trim. Worn on the left pocket, in the 3 o’clock position. A diamond-shaped cloth badge, gold and light blue embroidered on dark blue background with gold trim. Worn centered on the left pocket. 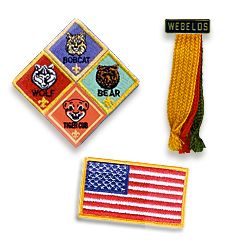 Webelos Scouts wear only the current badge of rank (Bobcat, Wolf, Bear, or Webelos badge) . An oval-shaped cloth badge, gold and light blue embroidered on khaki background with khaki trim. Worn centered on the left pocket, with no other rank patches. A gold design embroidered on a tan background with a blue border. Worn on the left pocket flap centered over the button. This is the highest award in Cub Scouting and the only Cub Scout badge that may be worn on the Boy Scout uniform. A council shoulder patch (CSP) emblem is worn by all Cub Scouts directly below the shoulder seam on the left sleeve. This emblem is unique to the BSA council hosting your Cub Scout Pack. A red, white, and blue embroidered American Flag emblem for all members. Worn by all Cub Scouts on the right sleeve, entered directly below the shoulder seam. It is standard issue on all Scouting uniforms. A white numeral embroidered on red background. Worn by all boys and pack leaders directly below council patch on the left sleeve. A gold numeral embroidered on navy blue background. Worn by Cub Scouts and Webelos Scouts centered and touching the bottom of the U.S. flag on the on the right sleeve. Webelos Dens may have a name and wear a Boy Scout patrol emblem instead of a den numeral, but they are still a Cub Scout Den. This emblem can be worn centered and touching the bottom of the U.S. flag on the on the right sleeve. Gold metallic numbered star worn with colored background to indicate years of service in Scouting. 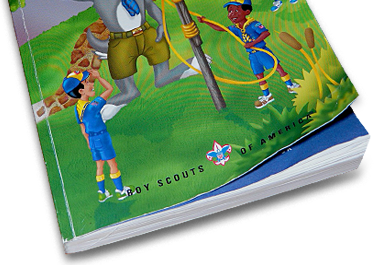 Cub Scouts and Webelos Scouts wear star(s) with gold background, centered 3/8 inch above the on the left pocket. Boys who have been Tiger Cubs may wear the Tiger Cub service star with orange background on their Cub Scout uniform.